I don't know who made this region, or the few cells of this. I would like to try and tackle some areas of this (if you think I should), but we need to conceptualize the region first. Also, I want it to contain three tiny border forts located as marked here. Each with a garrison as well as a small census and excise office. The transition towards Hammerfell hasn't strucken me as a major oddity yet. I wonder, if we should actually utilize this area to add in 1 or 2 dwemer locations using vanilla dwemer assets, but in an unfamiliar way. Actually tried my hands on that some time ago, wonder if I still have the file. Don't know how unfamiliar they are though. That doesn't look wrong at all. It should only be minor outposts, though. Not necessarily with interiors even. Possibly caves, where they mined copper ore or something similar, if only to make a vague nod at Fang Lair in Arena. I'm fine with having a small outpost. Looks good to me. 1. 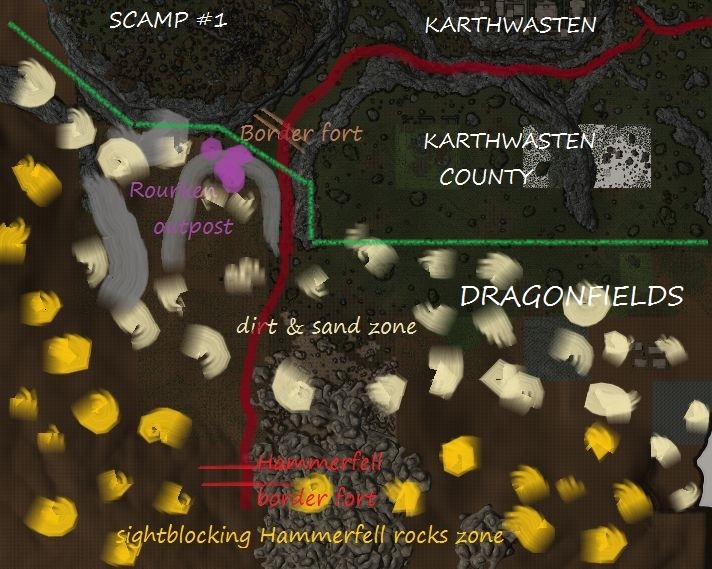 I propose we create a dummy region "Hammerfell, Dragonfields" in all cells past Aldkarth border fort, mesa near Karthwasten and Druadach mesa #1. This way players would immediatly know they are not in a supported area anymore. Plus, there already was "Hammerfell" region in last year's main exterior file, with some nice dirt cells, but I think we should rename that region to follow our naming convention, so it's composed of two elements. That region would be 3-5 cells wide, with grass disappearing gradually and dirt taking it's place. Eventually it would end with a wall of Hammerfell sightblocking rocks, in which a road to Jehenna would disappear behind Hammerfell border fort. These big rocks can supposedly be a foreland of Dragontail Mountains, but we shouldn't overthink them. They are there just to block distant view, period. From what I imagined, this region can be considered a middle ground between Aldkarth and dirty Druadachs, with some stains of Hammerfell dirt and rocks too, that gradually would become dominant. There are more trees here than in Druadachs, to live up to it's reputation of a woody region, and far more dirt than in Aldkarth area. Literally no "clean" Reach grass texture, but a dirt variant of it in grassy places. Other than that, rocky dirt_04 and dirt_03 are dominating. 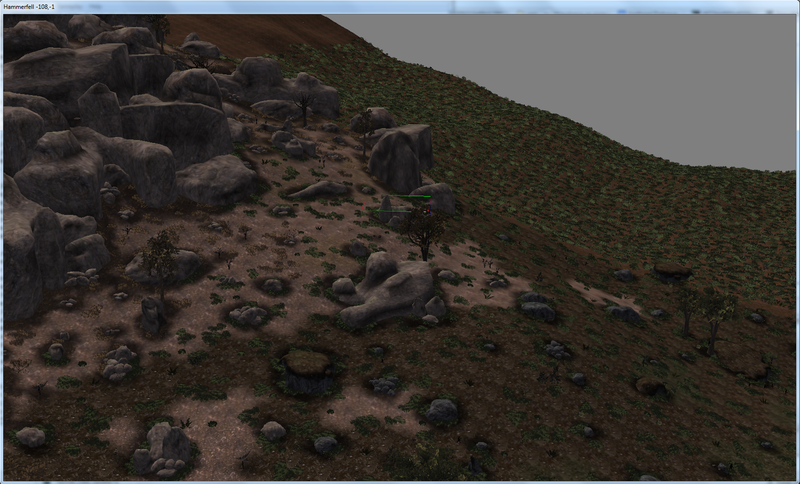 There are some overgrown rocks and sudden terrain edges too - overall this area should feel quite rough, like Druadachs. I'm not really sure on it, but maybe taking advantage of common data, there can be some sparse aloe vera plants growing in a dry part of this region too? On one hand, such trans-provinsional modding is why the merge was started in a first place, but then, as it's not really a full-fleshed and fully supported region then I'm unsure if it's reasonable to give it unique plants, that might lure the player. 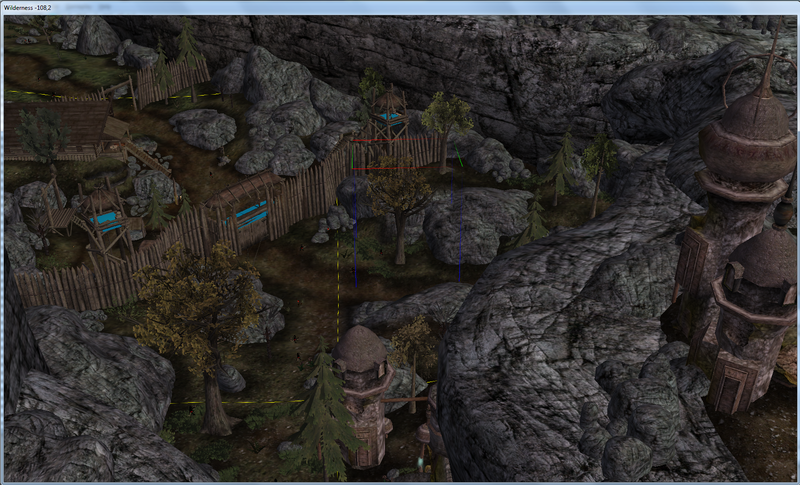 Sky_Flora_Grass_Dry_01_ starts to appear just behind Skyrim's border fort, and it's number increase gradually. Eventually, it fully supersedes it's green counterpart. Shrubs and ferns can be encountered in whole area. Leafy Reach trees 1&2 and Reach pine trees. Close to Skyrim's border, roughly 2/3 of leafy trees should be dry or dead, and this numbers should increase even more when going further south. At the feet of sightblocker rocks there should be only dry or plain trees. Likewise, less and less pine trees as you are leaving Skyrim. No interiors. 2. To make our lore right, this Dragonfields region might include cells around Dragonstar with the city itself too; that is excluding nearby Druadach mesas and a canyon. 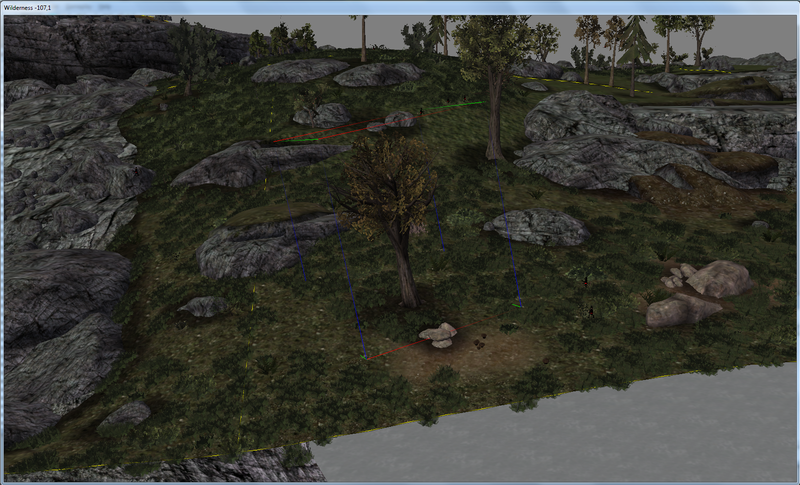 I haven't really started working on a landscape in this claim, so it would be easy to take care of. 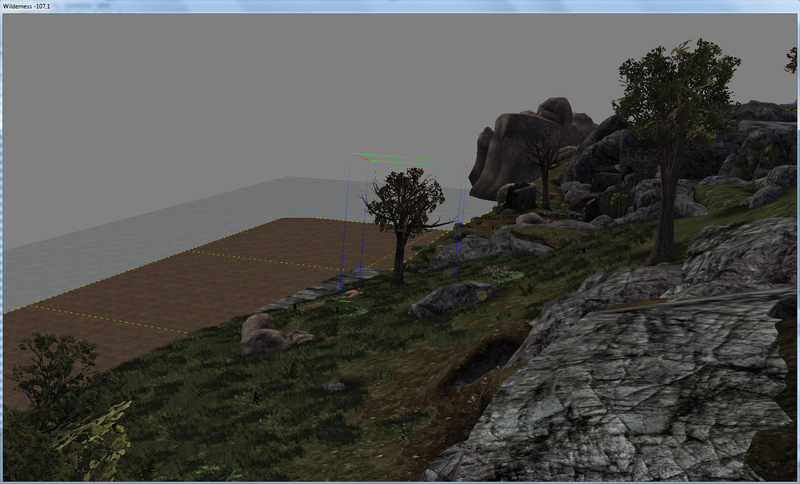 Also, inserts of Hammerfell rocks/dirts should be much more subtle there, if any at all. I'll see if I can make it right. On the other hand, I see more trees around the city, compared to the Jehenna-Karthwasten border, could work here, maybe even a small forest. It would be good to have 28 and Dragonstar finished first, at least. And then maybe one should create a more complete map of where this area extends in detail. It would also be a good idea to make ourselves a picture of where we are within the province of Hammerfell, if we start building a fraction of it. I'm not fond of that destroyed border fort you added. The current border is marked with nordic fort already. Also this submerging of the tower with the rock is a bit strange. I can't see it having worked in its intact times. Better to add one to the final mountain range of the Dragonfields, if we already want to extend towards them? We actually didn't want to mess with this area for a long time to focus our resources on the own provinces. Then again, I can see how this would provide a welcome exchange and would fix the problem of landscape leading into nothingness. Still our priorities should be finishing the Reach itself over making this border coulisse. I feel quite oppositely about it myself. I can't finish 28 & Dragonstar properly until we have our minds set how to deal with Hammerfell-Skyrim border. It's not also really about extending our worldspace or starting work on a new proper region, of which we we'd have to have a solid vision of, but about closing SHotN area, finishing cells already present, in closest proximity - 2-3 cells from border fort. Though now that you mention it, maybe that area could be an U-shaped valley, with these cells in the middle, slowly narrowing towards Dwemer mesa and spineinside's claim? Most cells in that range are finished and would require naught but a brush-up, so it'd be done with a minimal effort really. I find your regional marks in your first suggestion ok. I have no objections against your regional plans, except that it should be just called Dragonfields without Hammerfell. This region may be just 3 cells in depth, but ingame its a considerable amount of space. Despite that I'm fine with having it mostly empty, apart from border forts. There should be a major dwemer ruin in the mountains southwest of Dragonstar somewhere, though (fang lair). 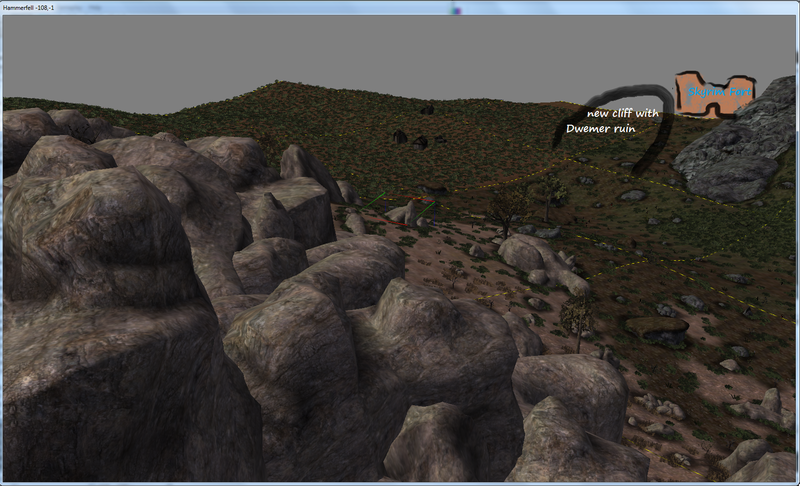 One thing I don't like that much is adding the hammerfell rocks to the tops of the mesas. If you imagine these plateaus as being massively made from the grey rock, it will make no sense having the yellowish rocks popping out of it. The rock transition would better happen in the space between the hammerfell border mountains and the mesas. I don't know how feasible it would be to add some kind of endpiece of the Dragontail mountains behind Dragonstar. On some maps the dragontail mountains even stretch into Skyrim. Edit: Overall, I'm fine if you do what you want in these parts. We were originally going to close our border with the mesas, but if you think you can handle this with a managable amount of effort, I'm all for it. Looks good berry. I agree with the points worsas has raised. 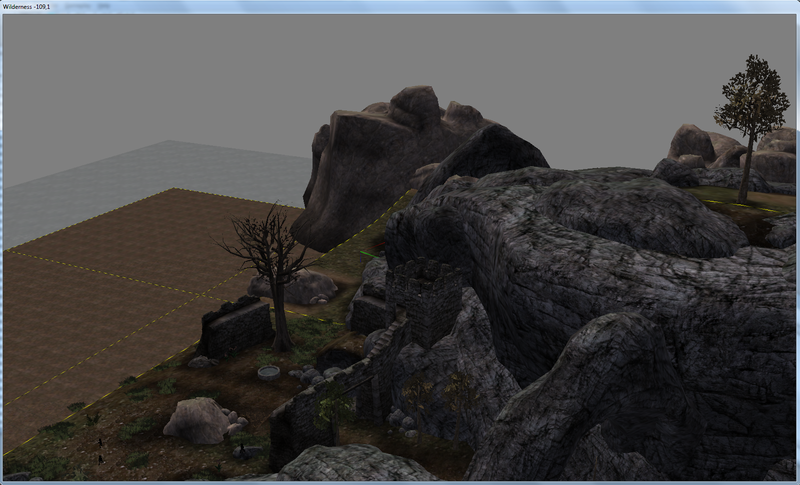 The Hammerfell rocks can't blend with the grey rocks, it has to be done more elegantly. Fang lair should be further south and outside of our mod. 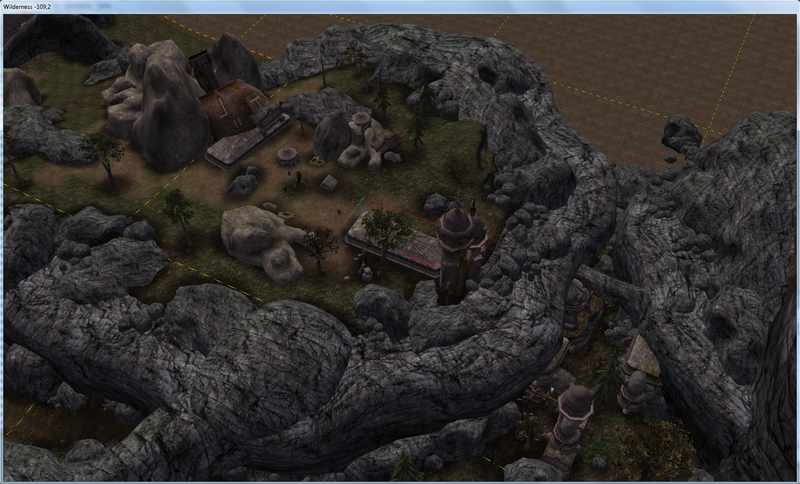 I should still have the file with Dwemer outpost as well as a Redguard border fort, Dkira. 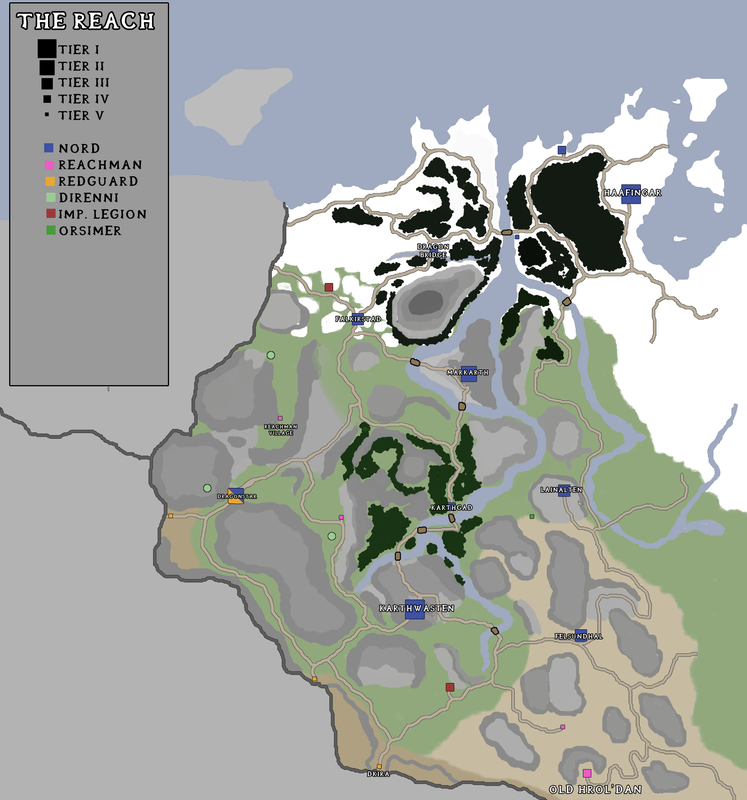 But in reality the Crowns should have no hold on these lands, and Skyrim has occupied the lands from Dragonstar to Elinhir (although they have a weaker hold on these lands than the Reach). On my phone, I will comment in more detail later on. I'm sorry if that seemed like I popped up suggesting adding us more work and expanding mod area further south. I agree "SHotN proper" should end on the line of mesas and Skyrim border fort; these few cells would be an eye-candy for distant land users. I'm positive I can pull them off with little effort. To be honest, I also don't think we ought to declare, even to ourselves, "these are Druadach Highlands, and these are Dragontails Mountains"; we all know they're somewhere there, but how about we leave this to players' perception and imagination? But then, that can also mess things up, so it probably can't hurt to give it some planning. Overall, I'm sorry if I gave an impression what I'm suggesting would require a lot of planning and work from us... the way I imagined it, it'd be opposite, actually. I have no objections against resigning from having Redguard ruins here. As for Fang Lair... I do have an idea for grand Dwemer ruins that might work here. if we do it, sounds like it might be fun. I was extremely unsure about using Hammerfell rocks so close to Skyrim myself, but they seem to look great in-game actually, going great with Dwemer. Vanilla knows some awkward rock zones transistion too, and I figured not everything here must be entirely reasonable, since it's not a real region. I mostly gave in to a rule of cool, actually. I'll try to rearrange this mesa though, removing at least those bigger rocks and avoiding blending two rock types together. As for the Hammerfell border fort, well, I don't really know, then. A road just disappearing in the rocks would be stupid, just as a lack of any road altogether. If I may ask, Worsas, what are your objections againt "Hammerfell, Dragonfields" name? If we are to go with a single-element name, I'd rather we stuck with "Hammerfell", myself. By the way, I'm not doing any work on this for know, focusing on non-controversial, Aldkarth part of claim 28, so there's no hurry in setting our mind here. The way I see it, it would be good to have this little piece of land finally behind us, though. In Shadowkey, the Crypt of Hearts is placed in Skyrim territory, near the Hammerfell border. Any plans to include it in any way? Or is it considered a part of High Rock as far as PT is concerned? Purely that it is inconsistent. Provinces don't show up as regional names in game. I'm really picky about this kind of thing. The borders in Shadowkey were very distorted from the conquest of Skyrim. The way I see it the Crypt of Hearts would be further west in Highrock. worsas wrote: Purely that it is inconsistent. Provinces don't show up as regional names in game. I'm really picky about this kind of thing. That's a fair point. I agree. "Dragonfields", being a one-word phrase, doesn't stick to SHotN's region naming convention as well though. How about something like "The Reach, Dragonfields Frontier"? That would stick to our naming scheme, imply it's a border zone here, and it has this nice, rough and militaristic sound to it. Now I see this whole matter is not as uncontroversial and a no-brainer that I originally imagined. I'll finish claim 28 first then, sticking to what we've agreed upon before, and we'll see later, as you said. If we include Fang Lair it should be near Kemel-Ze like levels of grandeur and importance. Interior-wise more than exterior. It could be weird to have such an important point of interest located on the border of our mod. That said, I'm not entirely against including it, but it should be further south, almost on the edge of Sundered Hills. I'm not sure I like the name Dragonfields for this region. Isn't Dragonfields supposed to be west of Dragonstar? I would love to see a mix between Hammerfell textures and rocks and pine trees. At the moment, I am opposed to having Fang Lair in SHOTN, at least at this time. Far too much work for something that has little to do with Nords and Skyrim. I've been thinking the same all along, to be honest. In any scenario it would have very low priority for a very long time. For the time being, it's named "Redgorge border fort" - I came up with that WIP name some time ago, but the more I think about it, the more I dislike it. It does sound like someone's rapidly shouting the names of Weasley twins, frankly. My proposal: something like Hissing (Whistling?) Dwarf Pass, to mention steam concertos given by nearby Dwemer ruins. Or Red Dwarf Pass - a play on "Redguard", Rourken dwarves and an easter-eggish reference to our world term. At any rate, I think it could be a good idea to go with something dwarven here - Dwemer ruins are a sight so unfamiliar for Nords I can imagine them considering it to be a distinctive landmark, a clear sign they're leaving their (widely understood) ancestor lands. I suspect it has been built within the last 20-30 years. The name might reflect that as well, or something to do with south, border, reclaimed land. Or just something simple. In other news, and wrong thread, how does everyone feel about renaming Aldkarth Fields to Karthspring region or Karthspring Fields region? I'm currently out-of-ideas myself. Hissing Dwarf Pass might work. roerich wrote: In other news, and wrong thread, how does everyone feel about renaming Aldkarth Fields to Karthspring region or Karthspring Fields region? I'd rather stick with the current region names, and avoid getting into the habit of changing them over and over. I understand your sentiment, but I thought we hadn't settled on that particular name yet. I really don't care for anything with "Aldkarth" in it. 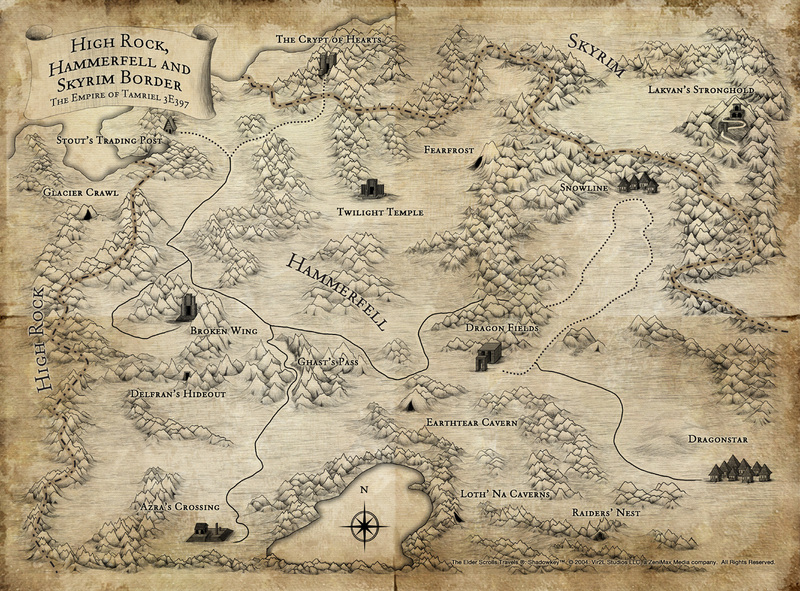 The other names like Druadach Highlands, Sundered Hills, Falkar Foothills etc. are solid IMO. Midkarth sounds fine as well, although I still think we have an overabundance of Karth-related names. On second thought, I'm not sure about the Hissing Dwarf anymore... doesn't it sound too much similar to, you know? Eh, I just can't come up with a name I'd find satisfactory make a call here, guys, and I'll support it. Karthspring sounds great too, but then again - it's still something with the "Karth" element. I want region names to be unique, so I don't want "Lowlands" even with a "The Reach" in front. Of those, Lorchwuir Lowlands sounds the best. These are good! Don't they sounds a little bit Reachman, though? But on the other side that can be a good thing given this area's history. What about Lorchwyr Heaths? We did agree on making pink heather MGE grass dominant in this region months ago, and I think a second element in this name could be made simpler - Lorchwuir Lowlands is a tad tongue-tangling phrase. For dialogues, we'd probably still need two more names for this area, one for locals (Reachmen ethnic-wise and member of other races in their culture sphere) and another one for Hammerfell loyalists. A Nordic name for the border fort makes sense too. Multiple names for regions would probably muddles things up to much and confuse players about what place everyone is talking about. If a name shows up on the mini-map, that's the name we should use in dialogue. I sort of like using Heath here, but I don't mind either way. I prefer Lorchwuir over Lorchwyr. The Reachmen connocations are very much intended. This is the Reach, after all. Lorchwuir Heath Region it is then. I wouldn't mind it being just Lorchwuir Region actually. 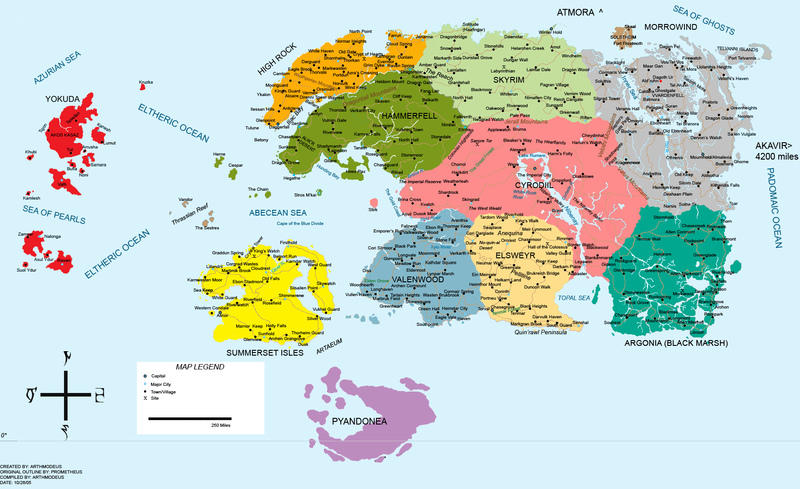 Not every region name needs a geographic description as well, like Sheogorad. We can always save the Heath name for later on. I don't see any reason at all to have several names for regions, barely even cities (only reason is to dedefecate Arena-era generic English names). Also, I think you're overestamitating the importance of Hammerfell in this region. Karthwasten was governed by Crowns, sure, but this area really isn't that Redguard-dominated, culturally. Just like it isn't Nord-dominated either. The cultural aspects would only/mostly be seen in large cities like Karthwasten and Dragonstar, but at the end of the day these cities are overly multicultural as is typical not only for cities in this general area, but for Tamrielic border cities in general - especially those located on busy trade routes. Vofelvard is a corruption of Dwemeris Volenfellvvard, the northernmost stronghold of Volenfell. The Dwemer dissappeared, but the name stuck. Could easily be another Dwemer placename that has been corrupted. 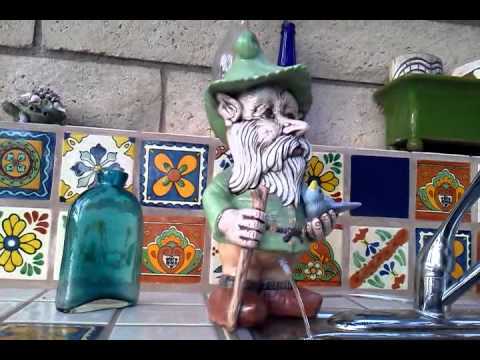 Duimachrad is a corruption of Duimach Druad, "Canyon of Dwarves" in the native tongue. An alternative name for the border fort (which would make more sense for the recently built nord fortification) could just be "Vorngyd's Stand", named after King Barda's father. Duimachrad would then just be the name for the canyon, if it should be mentioned by in dialogue.